I will be on vacation Sunday 6/25 - Friday 6/30. When I get home I'll answer emails as they came in for this litter. As of today, all the people on the waiting list have been contacted and have either not returned correspondence or this is not a good time for them to have a puppy. All five of these puppies are available as of today, Wednesday, June 21. Send me an email if you're interested in viewing one of these puppies and to place a hold which $200 deposit. Look forward to hearing from you soon. 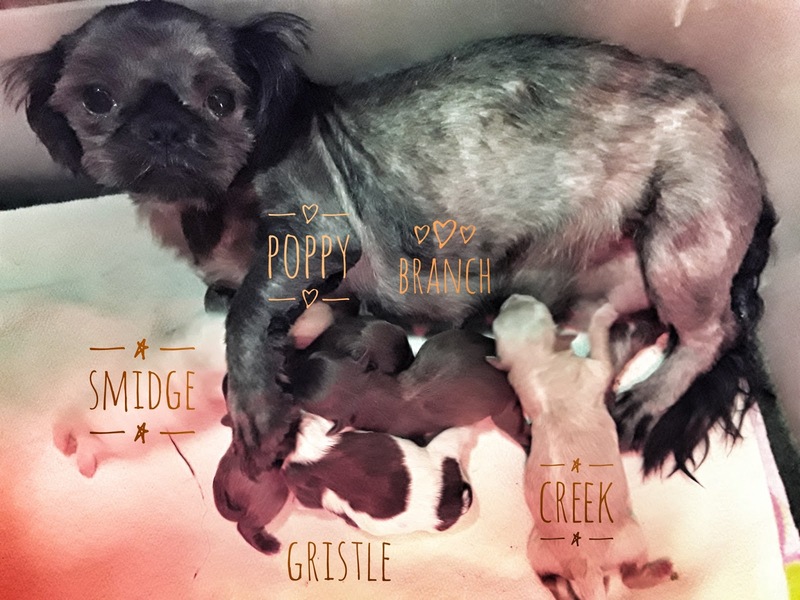 Introducing Lilac and her first litter of puppies! Born late last night, Lilac had five absolutley gorgeous little ones. Lilac surprised us, being a blue herself, with two solid chocolates(reds, 1m & 1f), one solid cream(m), one parti-cream(m), and a chocolate/white bicolor(m). These little ones will be raised using the Puppy Culture method and ready for forever homes on August 14th. Pardon the poor picture, but Lilac was very tired, freshly cleaned up, pampered and the red of the heatlamp distorts coloring. In a couple days, new pictures will be posted.